As the U.S. economy enters 2012, the gross government debt to GDP ratio stands near 100% (Chart 1). Nominal GDP in the fourth quarter was an estimated $15.3 trillion, approximately equal to debt outstanding by the federal government. In an exhaustive historical study of high debt level economies around the world, (National Bureau of Economic Research Working Paper No. 15639 of January 2010, Growth in the Time of Debt), Professors Kenneth Rogoff and Carmen Reinhart econometrically demonstrated that when a country's gross government debt rises above 90% of GDP, "the median growth rates fall by one percent, and average growth falls considerably more." This study sheds considerable light on recent developments in the United States. After suffering the most serious recession since the 1930s, the U.S. has recorded an economic growth rate of only 2.4%. Subtracting 1% from this meager expansion suggests that the economy should expand no faster than 1.4% in real terms on a trend basis going forward, which is virtually identical with the economy's expansion in the past twelve months. In highly indebted countries, governments have expansively taken resources from the private sector through taxing and borrowing. This leaves the private sector with less vigor to produce jobs and increase productivity, and subsequently wealth for its fellow citizens. This theory, which dates back to David Hume's essay, Of Public Credit published in 1752, is now being played out in real time in the United States. We judge that when an economy is expanding in such a meager fashion it is exposed to an increasing frequency of recessions. We expect such a recessionary event to emerge in 2012. It would be difficult to devise a more horrendous set of fiscal policy parameters to spur economic growth than currently exist. Real federal government purchases of goods and services, which comprise 8% of real GDP, will decline by about 1% if the impartial projection of the Congressional Budget Office (CBO) for a fiscal 2012 deficit of about $1.3 trillion is in the ballpark. Defense spending will bear most of the decline in federal expenditures, but non-defense spending will, at best, be flat. In spite of record deficits since the spring quarter of 2009, real federal government purchases of goods and services have risen at an anemic 1.5% annual rate, confirmation that only a small amount of exploding expenditures went for infrastructure projects. The scant growth rate in the economy suggests a negative outlay multiplier. Contrary to common belief, the massive deficits of recent years will actually reduce economic growth in 2012 through a subtle, but nevertheless credible channel consistent with the preponderance of economic research. Studies suggest the government expenditure multiplier is zero to slightly negative. Increased deficit spending does appear to provide a modest lift to GDP for three to five quarters, depending upon the initial conditions of the economy. However, following this small, transitory gain, deficit spending actually retards GDP growth and the economy returns to its starting point at the end of about twelve quarters. Based on our interpretation of these studies, the U.S. economy is now on the backside of the string of record deficits, and this will be a drag in 2012. Despite the massive spending, all that is left is an economy saddled with a higher level of debt, with more of its productive resources diverted to paying the non-productive elevated level of interest payments. 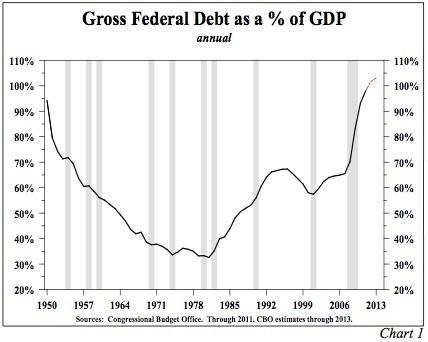 According to the CBO, gross federal debt will rise to at least 103% by the end of 2013. However, if the FICA tax reduction is extended for the full year, and/or a recession ensues, as we expect, revenues and expenditure estimates by the CBO will prove to be too optimistic. Under current circumstances, no viable way exists to remove the increasing federal debt burden from the economy's growth trajectory. As such, the federal fiscal constraint is operative for the foreseeable future. 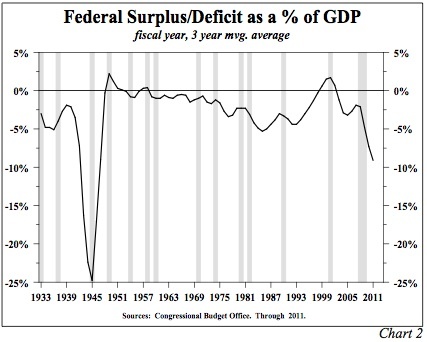 In the past three fiscal years, the budget deficit averaged 9.3% of GDP (Chart 2), the highest since 1943-45. 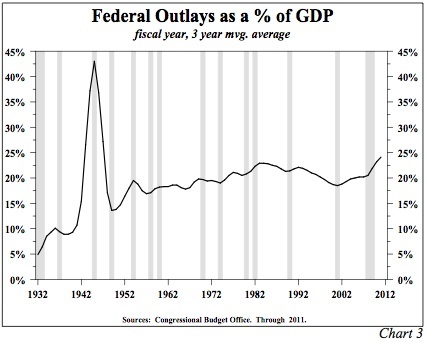 Federal outlays were almost 25% of GDP (Chart 3), and also the highest since the final three years of WWII. Dr. Barry Eichengreen of the University of California at Berkeley, author of Exorbitant Privilage, estimates that after 2015 this outlay figure is headed to 40% over the next quarter century without major structural reforms in Social Security and Medicare. For Dr. Eichengreen this means that the current law cannot remain unchanged in spite of the lack of political will to deal with the issue. Dr. Eichengreen states: "The United States will suffer the kind of crisis that Europe experienced in 2010, but magnified. These events will not happen tomorrow. But Europe's experience reminds us that we probably have less time than commonly supposed to take the steps needed to avert them. Doing so will require a combination of tax increases and expenditure cuts." He goes on to point out that, "At 19 percent of GDP, federal revenues are far below those raised by central governments in other advanced economies with spending on items other than health care, Social Security, and defense and interest on the debt having shrunk from 14 percent of GDP in the 1970s to 10 percent today, there is essentially no non-defense discretionary spending left to cut. One can imagine finding small savings within that 10 percent, but not cutting it by half or more in order to close the fiscal gap." Consistent with this analysis, the Trustees of Social Security and Medicare have calculated that the present value of unfunded liabilities of these two programs totals $59.1 trillion. Additionally, there have been tabulations that all federal government liabilities, including those of Medicaid, veterans and other defense obligations, pension liabilities of government employees, and additional federal programs total $200 trillion at present cost. These massive unfunded liabilities, when coupled with our present trillion dollar deficit, point to the stark reality that significant revenue increases and serious cuts in all programs will be shortly forthcoming. If these readjustments take advantage of current knowledge regarding tax and spending multipliers, the economic implications should not be severe. Clearly the only solution for our present predicament is to have a vigorous and rapidly expanding private sector and a shrinking public sector. As an investor concentrated solely in Treasury securities, our maturity structure will depend greatly upon the timely resolution of the country's present deficits. State and local purchases of goods and services (10.9% of real GDP) has fallen at a 2.1% annual rate since mid 2009, and is poised to decline further in 2012. The fiscal condition of these levels of government has improved due to rising tax revenues and expenditure cuts. However, about one half of the states still face deficits in the final half of the current fiscal year and/or in the new fiscal year that begins in July 2012. Also, these budgets do not reflect the unfunded liabilities of their pension funds that are experiencing another year of investment returns that are considerably less than their actuarial assumptions. Further, a number of states enacted temporary tax increases that expire. Thus, state and local governments must continue to either cut spending or renew the taxes that politicians promised were temporary. The seeming improvement in state and local finance is an illusion, and this drag on economic activity will continue. Monetary policy has broad powers, and many of those were wisely used during the financial panic of 2008. Subsequently, however, the exercise of those powers has been counterproductive to the average U.S. citizen. Two rounds of quantitative easing have raised inflation, but the pace of economic growth did not respond and the standard of living of U.S. citizens fell. During QE2 there were transitory increases in stock and commodity prices, but real consumer wealth fell. Money growth surged in both instances of easing, but the velocity of money fell sharply just as Irving Fisher in 1933 indicated would be the outcome in a highly over-indebted economy. In both these actions moderate income households fared the worst, thereby aggravating the divide between the upper and lower income categories. Some have advocated another round of quantitative easing under the assumption that in some unspecified way it might work better than the two previous failed efforts. However, QE3 has actually begun, in stealth form, via the European bailout. Since this program was announced, the price of oil and some other commodities has risen, bringing along the risk of a further drop in the real income of consumers. The unintended negative consequences of Federal Reserve actions appear to be continuing. Writing in the Wall Street Journal on December 28, 2011, Gerald P. O'Driscoll Jr. of the Cato Institute and a former Dallas Fed Vice President said the Federal Reserve is engaged in a bailout of European banks under the guise of what the Fed terms "a temporary U.S. dollar liquidity swap arrangement." Dr. O'Driscoll indicates the Fed and ECB are engaged in this roundabout transaction since each needs a "fig leaf" because the Fed does not want it known that the Fed's balance sheet is being made available to foreign banks. He cites three problems with this approach. "First, the Fed has no authority for a bailout of Europe. ...Second, these Federal Reserve swap arrangements foster the moral hazards and distortions that government credit allocation entails. ...Third, the nontransparency of the swap arrangements is troublesome in a democracy." In addition to these problems, we would add that, in the final analysis, this new program is simply another expansion of the Fed's balance sheet. This program will make the Fed's balance sheet even more bloated relative to its mere $54 billion of capital, just 1.9% of total liabilities. Without evidence to the contrary, we fail to see how this cleverly named swap program can achieve any type of satisfactory outcome. In fact, any other balance sheet expansion activities, such as the additional purchases of mortgage-backed securities, will also fail to result in positive GDP expansion. On the contrary, the uncertainty created by untested Fed interventions will inhibit business planning and reduce risk taking, thereby slowing growth. In order to improve business conditions, improve psychology, and create a stable planning environment one approach would be a five year moratorium on all new fed actions and banking regulations, and a settled tax policy. Until that is accomplished, "animal spirits" will be depressed. The interconnectedness of global activity will serve to further destabilize the global financial system in 2012. Although the federal government debt to GDP ratio is surging past 100%, if private indebtedness is included our debt to GDP ratio exceeds 350%. The same calculation reveals a debt ratio of 490% in Japan, 443% in Euro currency countries, and 459% in the United Kingdom. Similar to the U.S., their growth rates are also falling rapidly. In fact, there is compelling evidence that Europe and Japan have already entered recessions. In addition, manufacturing recessions have emerged in China and India, and growth in the Brazilian economy came to a standstill in the third quarter. These contracting growth rates suggest that U.S. exports will contribute to slower growth in 2012. Exports have been critical to the expansion of the U.S. economy since the end of the last recession. Compared with the tepid rates of expansion in consumer expenditures of 2.1% and overall real GDP of 2.4%, real exports have surged at a 9.7% rate. Thus, the fast rising gain in exports equals slightly more than 48% of the increase in real GDP from the recession low. Considering that exports spur the need for increased non-residential fixed investment, as well as higher inventories, it is clear that without a booming export sector our expansion since 2009 would have been truly dismal. Unfortunately, the negative feedback of a global recession will not only impair the U.S. exports sector, but also will cause a steeper downturn overseas. For instance, in Germany, the United Kingdom, and Japan exports accounted for 51%, 30%, and 16% respectively of their GDPs in 2011. In France, Italy and Spain exports averaged about 29% of GDP. The loss of exports to the United States will be most detrimental to the European economies, feeding back to a slower export sector in the United States. Thus, the main driver of growth (exports) for this expansion will be sharply diminished in 2012. Beyond the slowdown in exports, the deteriorating financial circumstance of the U.S. consumer is also contributing to the recessionary conditions this year. 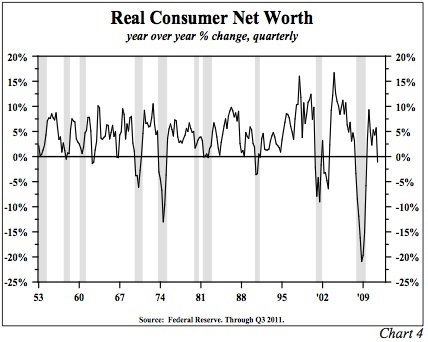 First, real consumer net worth (Chart 4) has fallen over the past year as domestic stock prices stagnated, foreign equities and lower quality bond prices fell, and home prices continued to decline. As indicated in Chart 4, a drop in net worth has been associated with the start of each of the past six recessions. The pace of decline in real consumer net worth is heavily influenced by home values. Home prices seemed to stabilize over the summer, but have recently fallen to new cyclical lows. Stubbornly high delinquency rates, sluggish employment, and declining real incomes all suggest a continuing fall in housing, the largest portion of U.S. consumer net worth. Second, consumer incomes in real terms have been falling. In November, real disposable personal income less transfer payments was at the same level as in December 2008 and April 2006. For a time, consumers can sustain spending by reducing their saving or increasing borrowing. 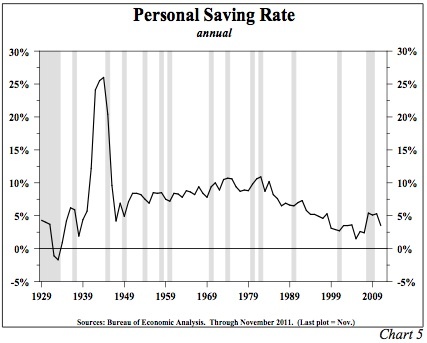 The impact of these efforts, however, was to lower the personal saving rate (Chart 5) from 5.8% in 2010 to just 3.5% in November, near the same level that existed at the start of the recession in 2007. We expect that consumer spending will slow to match the existing trend in negative real income. A third restraint on the consumer is rising taxes. At the end of 2010, total federal, state and local taxes accounted for 17.76% of personal income, but by October the effective tax rate was up to 18.20% despite a 2% reduction in the FICA tax rate in 2011. The offset was a rise in state and local taxes last year, and further tax increases are expected in 2012. Adding to the recessionary woes of 2012 will be a retrenchment in capital spending. Accelerated depreciation of 100% was permitted for all capital expenditures provided the items purchased were installed by 12/31/11. This year the accelerated depreciation drops to 50%, resulting in a dramatic increase in the after-tax cost of such outlays. If the past is any guide to the present, businesses have worked this one-year tax gimmick to their advantage, just as they did previously. Firms looked into 2012, and in some cases even further, and pulled those outlays into 2011. This creates an artificial boom/ bust cycle which will be evident in 2012. However, the fourth quarter is showing strength; thus, our expectation of a recession beginning in the fourth quarter was premature. Significantly, as 2011 was ending, the tax benefit was clearly wearing off. Non-defense capital goods orders (ex aircraft), which is the best leading indicator of capital spending, fell by 1.2% in November, after a 0.9% decline in October. For the three months ending November, shipments in the same category fell by 2.2%. Consequently, a sharp recovery in December would still leave real private investment in equipment and software unchanged for the quarter, the worst showing since the end of the 2009 recession and a dramatic reversal from a 16.2% surge in the third quarter. The 100% accelerated depreciation pertained to all sorts of capital goods from passenger cars and light and heavy trucks, on the low tech side, to sophisticated computers and related equipment, on the high tech side. Therefore, the flat fourth quarter expenditure level should give way to a sharp decline in the first half of 2012. This weakness would have occurred regardless of the other factors influencing capital spending, but with exports faltering and corporate profit margins being squeezed, the fall-off in business investment is likely to be sharper than the normal expiration of such a transitory tax benefit. Therefore, the 2012 recession will be caused by the combination of retreating capital spending, lower consumer spending growth, declining exports, and a spending drag from all levels of government. The actualization of a recession in 2012 will be especially difficult for the average American in that we have not really recovered from the previous recession ending in 2009. This obviously is not a typical business cycle; rather, we may be in the midst of what Harvard historian Niall Ferguson titled a "slight depression." The reason for this analysis is that real personal income less transfer payments, one of the four coincident indicators the NBER uses to determine recessions, has recovered off its recessionary low in 2009, but is still about a half trillion dollars below where it was in 2008. Industrial production is still off 5% from its peak and no higher than in 2005. Full time employment is at the same level as in May 2000, despite a 28 million person increase in population and a 11.4 million rise in the labor force. Real median income stood at $51,800 in 2007, but for the first time ever has declined in this recovery and now stands at an estimated $49,400, a 6.4% drop from the previous peak. These statistics painfully point out the adjustment process in an overleveraged economy. The long end of the Treasury market witnessed a decline in yields from 4.34% at the beginning of 2011 to 2.89% at the end of the year. To most, this 35% return was a surprise as there was near unanimity of opinion that rates would rise in connection with the higher real economic growth rate that was expected for 2011. Similarly, faster growth seems to be embedded in most rate expectations for 2012, and concomitantly expectations are for interest rates to rise. If recessionary conditions appear in 2012, as we expect, then even lower long-term interest rates will be recorded. Van R. Hoisington Lacy H. Hunt, Ph.D.
Jan. 20, 2012, 11:21 a.m.
Perceptive and important comment by Paul Kaestle. I wondered if anyone were going to mention it. Jan. 19, 2012, 1:39 a.m. While all this technical analysis is interesting, it seems to tell us the light at the end of the tunnel is an on coming recession train. How about a few words on what the sugar we retired folk should do with our investments. As I believe you cannot time the market, I am hoping my asset allocation is going to leave me enough deniro to make it through with out having to become a greeter at walmart. I am also practicing the phrase “You want Fries with that? Jan. 17, 2012, 9:39 p.m. So long as our productivity keeps up, we need not fear too much inflation. 2% is about right. Alarm about hyper-inflation as been false. The USA with its fiat money will never be like the Europeans locked into the Euro, where they have no say in the amount of there money supply. “Debt Limit” is a congressional construct left over from the old Gold Standard. Our"Debt” as such is owed to ourselves, the Treasury gives and the Treasury takes away. So long as they keep a good balance we are doing OK in problem-filled world. Jan. 17, 2012, 7:11 p.m. I love economics gurus who point to Social Security and Medicare as the only way to cut expenditures in the federal government. Instead of requiring the banks to buy bonds, require them to make reasonable loans to reasonable businesses. Repatriate from the IMF and Europe some of the money that we created from nothing. I see waste every day with a solar research institute that has produced no saleable product in its history and no real improvement in any solar product. The thought that we can get rid of departments wholesale in the US government seems so farfetched to so many, but is really necessary. Energy is one that can go. Education was better when the federal and state governments were not involved. They increased the cost and decreased the educational levels. Housing? Really? Many indigent families receive adequate money for living, but still don’t pay their rent. Our county is laying out money for this through cards and then the family spends it on something else and won’t pay the owner. This comes from federal funds. Medical care for all. How is that going to be funded? It won’t save money, no matter what the idea was behind it. It costs more for the paperwork in the doctor’s office than for the actual face to face care. The average here is three paperworkers for one doctor. And when I tell them I owe them money and they don’t take it and then send me a bill for $10 that cost $20 to prepare, I just shake my head. Inefficiency is rampant. Start using logic and common sense to cut $1.6 trillion per year and the government could do it. How facetious is it for the president to cut 2-3,000 workers and $3billion from the budget? The pain would be sharp, but a lot briefer than the past five years have been. Jan. 17, 2012, 3:26 p.m.
Its refreshing to see an article based on logic, backed by credible evidence. We are inundated with emotional articles either for or against the current administration. Jan. 17, 2012, 12:47 p.m. I follow and agree with most of this analysis. I don’t see any evidence of the central premise that the governments of highly indebted developed countries deprives the private sector of funds to grow and prosper. Part way through, “Although the federal government debt to GDP ratio is surging past 100%, if private indebtedness is included our debt to GDP ratio exceeds 350%”, seems to demonstrate that the private sector has had plenty of access to capital. Likewise, some say that US corporations have about $2 trillion on the books, and another $2 trillion offshore (patially to avoid repatriation and subsequent taxes), so it seems like there is no lack of capital, only at lack of opportunity cost at this point. Jan. 17, 2012, 7:26 a.m.
A sound and rational analysis. There comes a time where even the biggest governments have to take the loss. Yet more money is not the answer, and it should have only been necessary to avoid a genuine melt down. And not a contious means of promoting a false form of economic growth. A growth that has produced yet more instability world wide. Jan. 17, 2012, 7:19 a.m. The Hoisington Review is a beautiful thing. I not only read every word, it’s so well written that I even think I understand it. Maybe that’s because I agree—I have had my very modest portfolio 100 percent in short and medium term Treasuries since about ‘06, even though my investment advisor thinks I’m nuts, but I haven’t lost a dime. Jan. 17, 2012, 5:06 a.m.